This is an example of a planter you can purchase from Hang’em Planters. Improve the look of your new deck this spring by including some flowers and other foliage. Using the same tools you would use build a window box, you can easily create a hanging deck planter box featuring the best of spring and summer foliage. You can either build the box yourself or purchase one from your local hobby or hardware store. Much like you might install a window box just outside your first floor window, hanging the box right off the edge of a deck rail will make the most impact visually. You want to choose a box that has proper drainage as well as enough area for what you intend to plant. Planting a simple annual flower that will overwinter well is a great idea for these kinds of decorative boxes. Just make sure that whatever you choose to plant has the right qualities to thrive in one of these boxes and can withstand direct sunlight or lack of direct sunlight depending on your deck. Consider the color carefully as well, where oranges, pinks and reds look great from afar, purple, azure, blue, green and white are really interesting up close. What you’ve chosen the box you want to use and the plants, complete the installation. This should be a pretty straightforward process using screws or nails, and it won’t even take that long (be careful if using a ladder though). Before you leave the hardware store, make sure to pick up the proper screws or nails for your particular deck. A hardwood deck will require wood screws, composite decking uses a special type of screw as well and so do PVC decks – just make sure the labeling of the package states where the screw can be used. You may also be able to find a color of screw that matches your deck. If you’re not sure how to get these color-matched screws, call your deck builder and ask! After you’ve completed the actual installation, make sure to use the special soil that these plants will need. Because they will be hanging, the soil where they’re situated needs to contain peat, perlite and other ingredients to improve drainage, aeration, fertility and water-holding capacity. It might also be worthwhile to add a polymer compound into the soil, this will give the soil additional capacity for water. You can purchase these products at your local garden store, most hardware stores and big box retailers during spring. Take extra care in the maintenance of the plants until you know how your plants are going to handle the heat, light, etc. Your plants are likely going to need to be watered daily or twice daily, depending on the type of plant, the soil you used and the weather conditions. Installing a hanging box is a fun, easy way to really take the look of your deck to the next level and have it looking ready for spring and summer. Weather damages decks, and that means on days with sunny skies or snow! Especially for wood decks that are built with standard materials, weather is one of the most significant sources of damage. As soon as you’ve finished having your deck installed is the when damage from the elements begins. No matter if the material is pressure treated, made of older cedar or redwood and naturally insect-repelling, no deck is proofed against the decaying forces of nature. UV exposure is the first culprit for the natural decay of a wood deck. Because the wood on decks is mostly laying horizontally, it also means that the deck is also usually receiving the most direct sunlight and UV exposure. Just like people, decks that spend too much time in direct sunlight will break down, especially considering the internal stresses from having the top surface at a broiling temperature while the bottom surface enjoys a balmy afternoon in the shade. You can tell a deck has been damaged by UV exposure when you start to see “greying.” This process can start as quickly as month after installation and will continue to worsen over time, getting darker and generally more unsightly as it ages. It’s important to treat your deck with protectants that help mitigate the damage from UV exposure and other sources as well, like moisture. Moisture exposure is extremely damaging to untreated wood. Your untreated deck may experience cracking, splitting, cupping or warping just from exposure to the elements without some kind of protection. There are any number of insects and fungi that love untreated wood and find it to be a suitable place to grow and reproduce, and moisture helps these lifeforms survive and flourish. Just because a deck says that it’s weatherproof doesn’t mean that it can deal with all types of weather forever. Weatherproofing is only useful for a limited span of time before it has to be done again. It’s also why you want to use a higher-end brand of protectant, otherwise you’re likely to have to be retaining your wood deck in only a year. The brand you choose should offer protection from insects, light, moisture and fungi all in one package, or in two separate products designed to work together (like a finishing agent and then a protectant). Don’t let the weather destroy your investment! Through vigilant application of protectants and sealants, your deck will last for many years – but don’t fall behind on the treatments, it doesn’t take long for it to end up severely damaged. The weather is getting warmer, and with any luck it’s going to stay that way. It’s finally time to start thinking about getting outside and making the outside a place where people want to gather and relax. No more hiding out inside! It’s also time to start thinking about the outdoor project you’re going to undertake this year. We think, and of course we’re biased, that a deck is the centerpiece of all things that go on in the back yard. We also know that a deck alone doesn’t make a yard livable or even inviting. It takes more than having a deck built to make a space really pop, and that usually comes down to decor, gardening and other features. One of the most important tips for successfully transforming your backyard into a sanctuary is being patient. Rome wasn’t built in a day and your personal back yard sanctuary won’t be either. It takes time and love to transform a space into a place where you always feel comfortable and want to share with friends or family. Identify the place that needs the most improvement and start by making a plan as to how you’re going make it better. For example, if your neighbor has a structure in their year that you’re not fond of looking at, then consider adding plants like sunflowers that are both beautiful and will grow to be very tall. You won’t have to look at the bothersome structure and you will get to enjoy the brilliance of sunflowers! Even so, this is one example, and there any number of things that you may want to improve. Even if you just change or begin to change one major thing about your yard per year, you’ll soon see the transformation! Remember that if you want to succeed in creating a fantastic space, you can’t be willing to give up! Get started today and see how easy is truly is to make a space you’ll be proud to call a part of your home. The weather is beautiful, so get outside and get moving! People build decks onto their homes for all different reasons, to use as an outdoor space, to host family gatherings or even to add/preserve a home’s value. 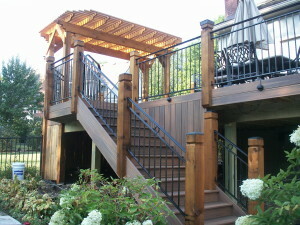 But any deck worth installing, is worth making sure that the aesthetics are top tier as well. A big piece of how your home is perceived by others comes down to your sense of aesthetics and how it is reflected in the design elements of the home. A deck offers an interesting aesthetic element that reflects the values of the person who built it, based on the type of material used, the size and the features included. A deck is more than just a home addition, it uniquely reflects a purpose unlike many other home additions. When you have a deck installed, it says that you value all of the space your home has to offer. While the interior space is important to the overall aesthetic, the fact that one would use an outdoor space as well says that you’re willing to make the extra investment because you value improving your home’s appearance and function. Your deck should be an expression of your unique aesthetic style as well as your appreciation for the space it affords. When you do add a deck onto your home, you should take care to have it built with the features you want. Lighting, fans, coverings and even built-in seating give your space life and allow you additional chances to personalize the space. Decoration can actually make a big difference when it comes to the appeal of the deck. Outdoor seating, for example, can include outdoor pillows and cushions that bring accent colors as well comfortable places to sit! Adding features like an outdoor television, while not strictly an aesthetic element, can make for a great experience when having friends over to watch live sporting events. Whatever your reason for building your deck, it’s a valuable aesthetic element and should be treated as such. Enjoy it, love it and make sure to keep it looking great! Getting a new deck is a solid investment, according to the 2014 cost versus value study from remodeling.hw.net, an industry-sponsored monitoring group. In North Central region of the United States, a composite deck addition typically recoups 72 percent of the initial investment. If we’re talking about genuine wood decks, that number shoots up to 81 percent in this part of the country. Despite having undesirable weather for (usually) at least half of the year, people are still more interested in homes that create some kind of outdoor living space. Also, the percentages being recouped by those getting new decks, and many other home remodels, are also going up in this area. Those thinking about getting a remodeling project done, or are planning to build a deck, should consider that their investment will continue to improve the overall value of the home as the trend upward continues. This said, there is no such thing as a dollar for dollar return on investment when it comes to remodeling projects. For this reason, we always believe that you should undertake remodeling projects or home improvement projects when you’re going to have the chance to enjoy the product of the labor. Building a deck onto a home, or installing a hot tub, or building a new bathroom will make your home more valuable, but the expense will almost always outweigh the improvement in valuation right off the bat. Fortunately, what you don’t recoup in dollar amounts, we believe you should recoup in time spent enjoying, loving and using your renovations. Especially when it comes to outdoor space, having a place to relax and unwind can offer vitally important down time, serving as a place to gather or find solitude. Measuring only recoup value is like measuring only the height of a tree, and not considering the shade and beauty it also provides. Renovations are about creating the space that you love and that you’ll use. Working with a contractor who understands this can help you achieve both an increase in your home’s value and a significant increase in the ‘wow’ factor your home offers to others, and to yourself. We’re pros, and we do painting, but not every job calls for a professional painter. While we usually paint as part of a remodeling process or new install, painting a wall or two that you can fairly easily reach doesn’t require a contractor. 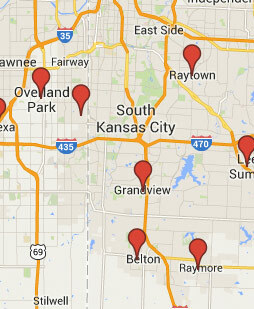 If you think you need a Kansas City area painter, make sure to ask yourself if you can do the job first. Can you reach the entire area that needs painting? Do you have time to finish painting? Are you willing to purchase the supplies that you will need in the quantity that you will need them? First, take everything that isn’t being painted off of the walls, and start by patching any holes and giving the areas to be painted a wipe down. Dirt and grime will leave an odd finish if painted over, so try not to leave any on the walls. Tape off trim, ceilings and corners with caution, and use the best painters tape you can afford (it will peel off much more easily at project’s end). Move furniture if possible, and place a tarp over the rest. You can be sure that paint will be spilt at some point! Make sure to leave time for any sealing putty to dry before you start actually painting. Next, make sure to properly ventilate and light the space. Breathing paint fumes is not generally a healthy activity, so make sure to place a fan blowing the fumes out of the house or wear a proper mask/breathing equipment if that’s not possible. If the space doesn’t have adequate lighting, make sure to use something like a shop light so that you don’t miss any spots and can be sure that the paint is drying evenly. Now for the actual application of the paint. Start at the edges and work your way inside from the corners. Your brushes will help you get the areas that the roller can’t reach – rollers aren’t designed for tight spaces. Make sure to go easy on the paint with the brushes at the corners, you don’t want to use too much and allow it to run down the wall. Use the roller to paint the wide, smooth lines that offer a clean and even finish. For heavily textured walls, you’ll want to use a roller with a thick nap (roller texture), whereas smooth walls require nearly no nap. Apply painting in thick strokes and covering as much as possible while applying even pressure. Pushing too hard can cause running and dripping. Don’t worry if you don’t get the entire wall in one go, you’ll need to apply two or three coats before it will be finished. Just make sure to let the paint dry in between applications! Getting started. It’s the perennial problem that many of us have to face. It doesn’t matter what the problem is, taking the first step to solving it is always difficult. In the case of homeownership, there are any number of improvements that you will want to make throughout the life of your home, but getting started will be the biggest road block. In such cases, it’s best to take some tips from the experts at life management. Getting motivated has to be a conscious effort, you have to tell yourself that you’re going to do it, and you have to remind yourself why you want to do it. Then you have to make it easy on yourself by creating a plan and sticking to it. Maybe you have a deck, for example, that has been getting older and the boards are starting to warp with the nails slowing popping out – just waiting for someone to take a wrong step. Even though you know it’s a safety hazard, you still might not be doing anything about it because “it’s winter. How could anyone get hurt on it during winter when nobody is using it?” Yet you still know that a dangerous deck is in your yard, and that eventually someone will be seriously injured by it. So make a plan to put an end to it right now, even if you’re not putting the plan into action today. Knowing when you’re going to start the project will make you more likely to actually do it. Don’t accept excuses for not having or sticking to a plan from yourself either. By planning ahead, you know exactly when you need to do something, and the more planning you do, the more likely you are to stick to it. The process naturally reinforces itself through its positive benefits to lifestyle and psyche. Plus, it means that one doesn’t have to deal with unexpected stresses as often as those who don’t plan for things like home renovations or live on the spur of the moment. Let us help you plan for you next major home improvement, from decks to home renovations, we will take the stress out of the process and will help you get a build plan in place months before we even start a project. Save some of the energy by having your plans made up this winter and getting an installation in the spring or summer! Last week we reach what we would call the “midway point” in the basement remodel over in Lee’s Summit area. We captured some images to show off how the work is progressing. Now the basement is really starting to take shape as an actual living space! We’ve finished all the drywalling and have divided the space into separate rooms. We have added in a ceiling over the entire space and installed lighting. Both features are necessary for making the space actually useable. The basement bedroom has now been added. To do this, we added additional wood and drywall to divide it from the rest of the basement. To give it all the comforts it needs and the safety it requires, we made sure to add an appropriately sized closet, along with an egress window. The egress window serves as an exit point in case of emergencies and gives the room natural light, making it a much better space for living. All of the home’s central air conditioning systems and water heater have been separated from the rest of the basement, but are still accessible through a new door. One might think that drywalling off so much of the space would make it seem more cramped, but it actually makes it feel like it has more purpose, and you don’t even miss the space taken up by the new rooms. One of the biggest things we’ve done is tear out the door and part of the wall that separated the basement from the rest of the home. It is now an open area, and this makes the basement feel like an extension of the living room upstairs. Because it’s not hidden away behind a door, it makes it a much more inviting place – it would be a perfect place to host a party. We have just finished installing the shower, and the toilet will be installed soon as well, making this basement great for both living and hosting. The home’s original designers did a great job of adding in large basement windows that let in lots of natural light and connect the basement with the back patio – perfect for summertime celebrations. Soon, this space will also include cabinetry and a bar area, which again could make this house the place to be when it comes to enjoying warm summer evenings with friends. We’ll keep posting images as we take them. We should be done with the project completely, save for a few finishing touches, in the next month or so! 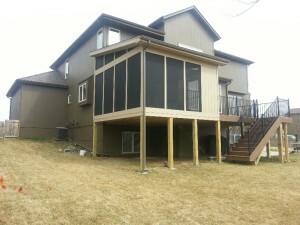 We use fine woods and composite materials when we build Overland Park decks. Wood is a fine material that is naturally strong and also long-lasting. When we tear out old decks for replacement, we remove tons of wood, never to be seen again by the home owner. But what happens to wood when it’s gone past the end its useful life? Of course, it could be trashed, but there are better ways that actually recycle the timber for later use. Recycled timber is perhaps the most environmentally friendly material to use when building a structure. As opposed to chopping down more trees for wood, recycled timber uses beams, planks and other structures taken from other buildings where the piece of wood is no longer serving its purpose. After removal, the wood is cleaned to reduce the possibility of rot and parasites, and depending on the use, it is refinished. While it is easier to just discard wood, recycling the timber is much better for the planet. It takes a fair amount of time to make sure not to damage the reusable parts, and even to identify them in the first place. The result however can be a very rustic, fine looking space when using recycled timber. One of the other possibilities for the wood that used to be your deck is that it will be turned into wood chips. Wood chips are great as they can be used for mulches, playground padding material and even to produce energy. After chipping, some power plants are capable of burning the wood to generate power. One ton of wood that is recycled saves around 18,000 BTUs of energy. Also, it can be used for interesting art projects around the home, from picture frames to serving trays! We love versatile materials, especially when you can do so much with them! After the December deep freeze, for the past week, the weather has actually been rather pleasant in the Overland Park and Kansas City areas. As we’ve been working in the area we’ve seen a lot of people finally heading outdoors again! It’s got us thinking about the busy deck building season ahead, and we want to share some tips if you’re thinking about developing a new outdoor space. First, consider what you want and why you want it. Having a deck may sound like something you want, but what else could it be? Think about it as more an extension of your living space than as a place outside your home. This might cause you to make some adjustments to what you’re actually seeking. Know your purpose, that way we can help you create a space that actually fits that desire. Consider the features you want as part of your deck. Once you have the purpose nailed down, think about what you’d like to do on your deck and how you’d like to use it. For example, if you’d like to use your deck in the evenings or at night, getting lighting installed might not be a bad idea. Some people prefer to have things like sound systems installed permanently, and knowing that on the front end will save time later. The right deck builder will also help you consider turning your deck into a screened in porch, protecting you from the elements and insects like mosquitos. Next, think about the time of year when you want to have the construction (and/or deconstruction as the case may be) completed. Maybe summer is the best time for you, but if you can getting any construction out of the way before getting into the season you want to start using your overland park deck, then getting it done mid-winter might be the right time for you. Or maybe you’re not ready at all yet to undertake a construction project during the middle part of the year. Fall can be a fine time to have the construction done, that way you have most of the year to plan it and set a date with the contractor to get started. Plus, some people will find that they can save some money on their taxes by getting such an improvement project finished before the end of the year. If you start considering what you want now, you should consider giving your Overland Park deck builder in Alexander Homes a call to get ideas and even an estimate of the cost. This way you can get the details straightened out now, even if you’re not planning to build for a while yet.